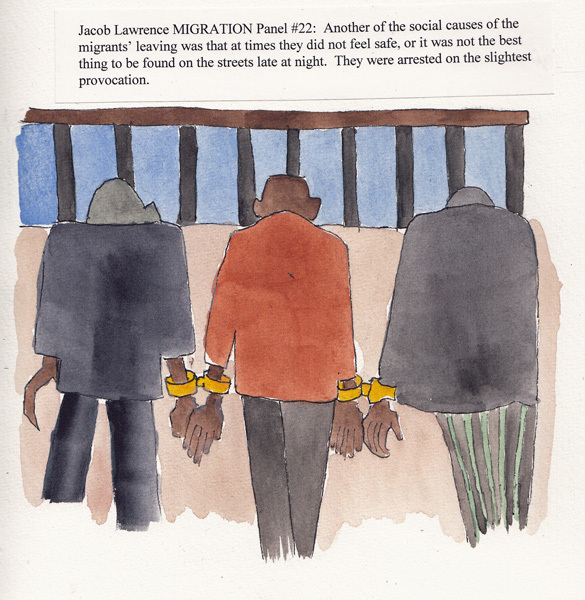 One Way Ticket, Jacob Lawrence's Migration series, opened at MoMA this weekend. At age 23 he painted these 60 panels to tell the story of the migration of blacks from the rural south to the urban north between WWI and WWII. He did extensive research at the Schomberg Center in Harlem and painted a series that tells an amazing story through paintings and captions. MoMA owns 30 "even-numbered" panels and the Phillips Collection in DC owns 30 "odd-numbered" ones. Periodically they reunite them and I first saw them many years ago in DC. I wasn't drawing or painting at that time, and only now do I realize how masterful he was at composition. Lawrence painted in tempera, and after drawing all 60 panels, he painted one color across all 60, and then added the second color, etc. The MoMA website has all 60 panels and a wonderful description of the exhibit. I had trouble choosing just one panel to copy, but kept returning to panels with 3 images - and finally chose this one. The exhibit also includes art, music, and photography from his contemporaries, including Marion Anderson's Lincoln Memorial performance. 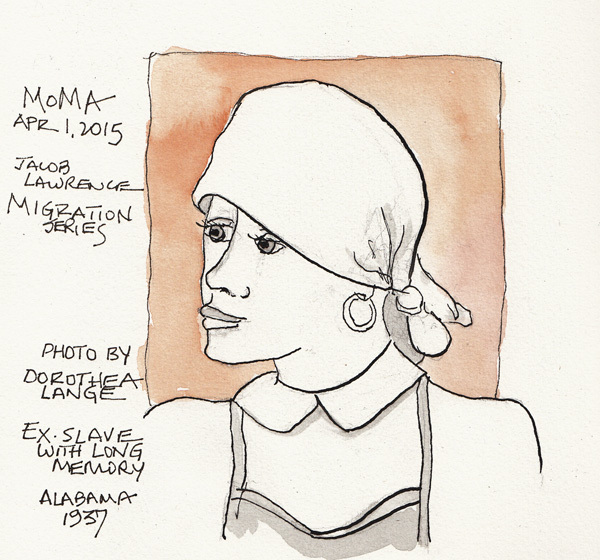 I loved one of Dorothea Lange's photographs of an ex-slave and sketched her as well. 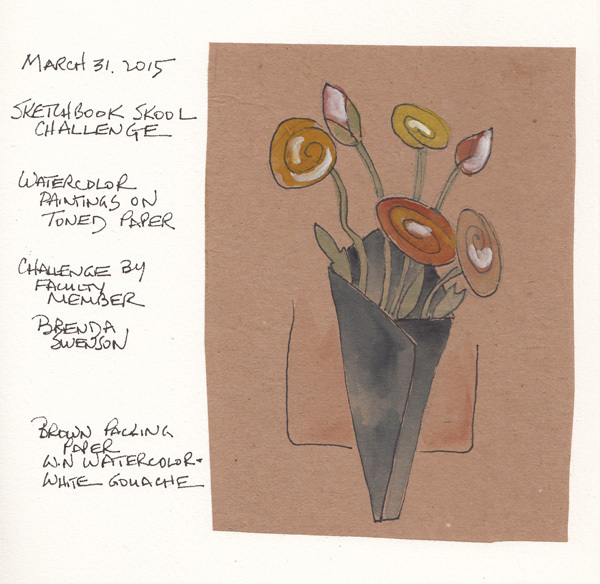 It is semester break at the Sketchbook Skool and faculty from the first 3 semesters are posting weekly challenges on the Sketchbook Skool Blog http://sketchbookskool.com/blog/. 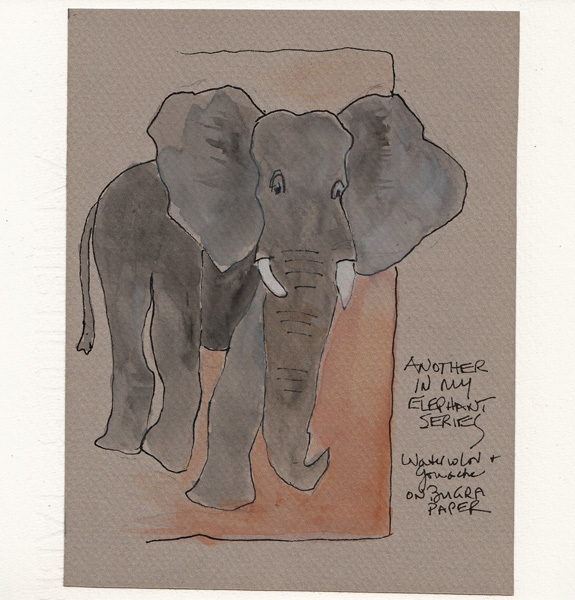 This week Brenda Swenson challenged students to do watercolor paintings on toned paper, using white gouache to add whites to the painting if needed. I did two paintings and collaged them into my sketchbook to reduce the paper buckling for scanning. A stylized bouquet of flowers on brown wrapping paper - watercolor and white gouache. 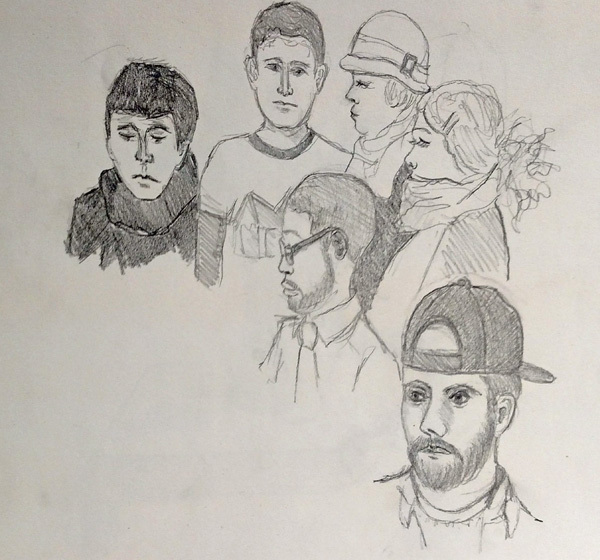 Lots of students are waiting impatiently for Sketchbook Skool Semester 4 to begin - and the blog is providing some relief with interesting videos and these challenges. Happy Holiday weekend to all! Our Drawing Classroom has many different props to be used for drawing exercises. This past week someone asked for bones instead of flowers and plants. I think it was our last week of using graphite and shading. 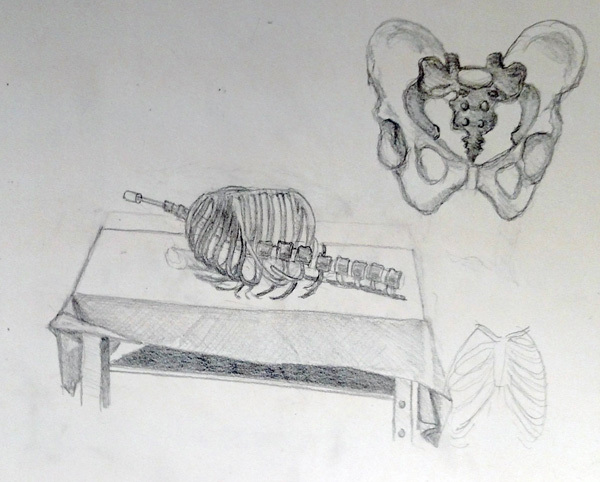 Our Professor put a rib cage and vertebra from a dismantled skeleton on a central table for all to draw and positioned an overhead light to create shadows. From my position, the top of the rib cage was on the left, and the vertebra in the lumbar region were on the right. But I wasn't looking directly at the rib cage from the side - thus the peculiar shape. I finished my drawing and asked him for another bone, and he gave me a pelvis to hold and draw. Here are both of my drawings - photographed, not scanned because of paper size. I still had time before our class ended to add two more classmates to my composite. After Spring Break we will start using pen and ink to draw. This class is moving really slowly and I'd love to know what others have done in a 15 week college semester course. 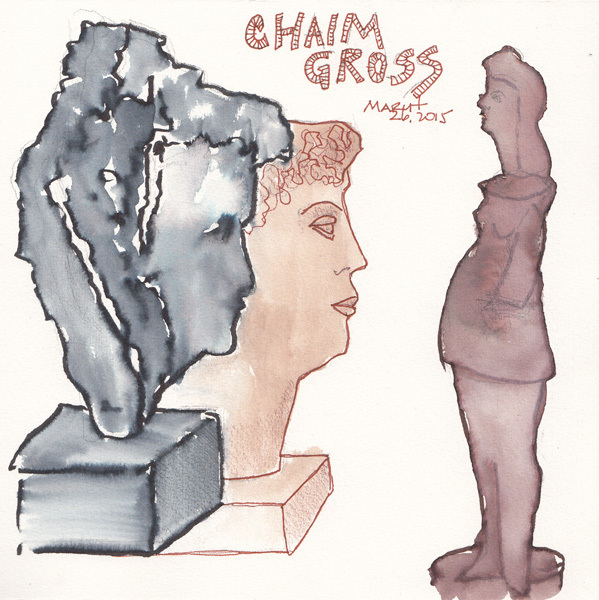 This week the "weekday" Urban Sketchers NYC group met at the Renee and Chaim Gross Foundation. This is a little known gem in the Village only several blocks from Washington Square. 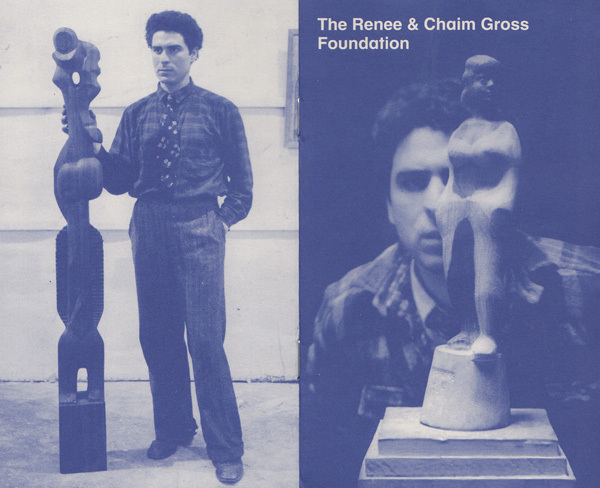 Chaim Gross was a sculptor and painter in NYC from his arrival from Europe after WWI until his death in 1991. After raising two children on the Upper Westside of NYC, he and his wife moved into a new home at 526 LaGuardia Place which served both as their home and studio. It is open Thursdays and Fridays from 1-5 and artists are welcome. The second floor contains his private art collection which is amazing, and special exhibits. 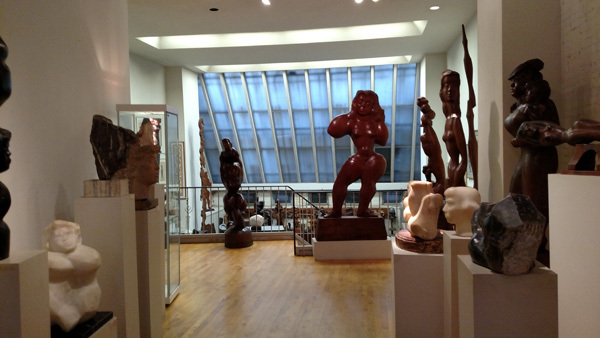 The 3rd floor has paintings from his contemporaries, and a huge African Art Collection. 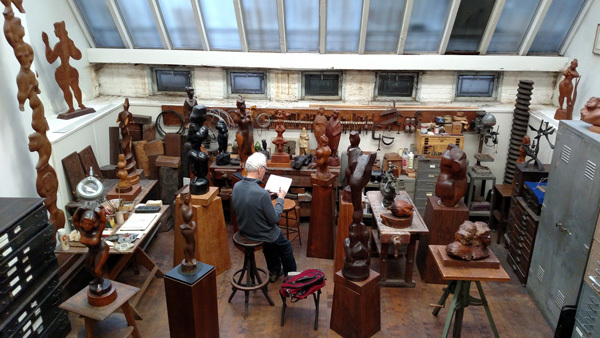 Two heads - one black and white marble and the other beige - and 4 of his wood sculptures on the first floor and studio. 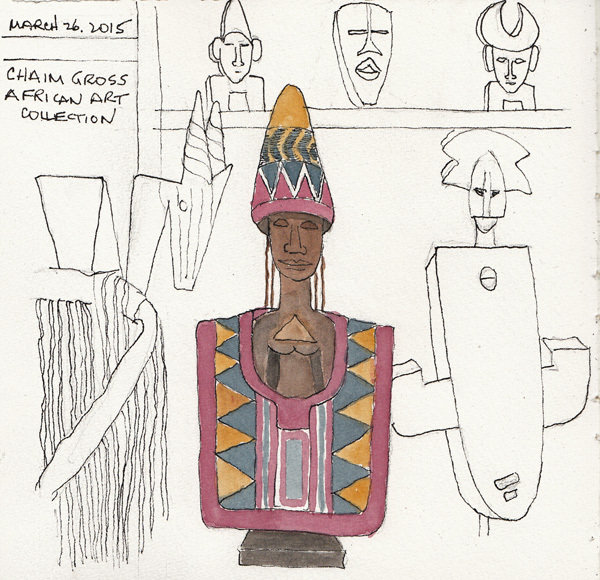 Yoruba beaded wooden sculpture and several other African art pieces on the 3rd floor. We are still drawing and shading with graphite in my FIT Drawing Class. 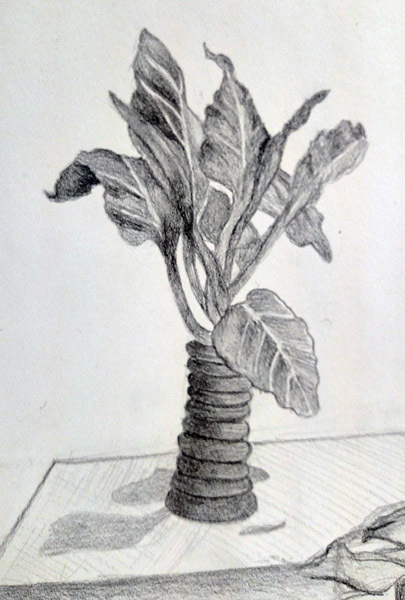 This week our in-class assignment was to draw and sketch this plant - dark green with light pink veins on the leaves. The class sits in a BIG square, at drawing desks, at least 6-8 feet back from the central table. A bright standing lamp is directed at the object to create shadows. As before, I finished drawing the plant and vase, and then thought only about my watercolor paints! And as before I remind myself that this is my first drawing class and I need to concentrate on the requirements of this course and use graphite to shade instead of paints to add color! 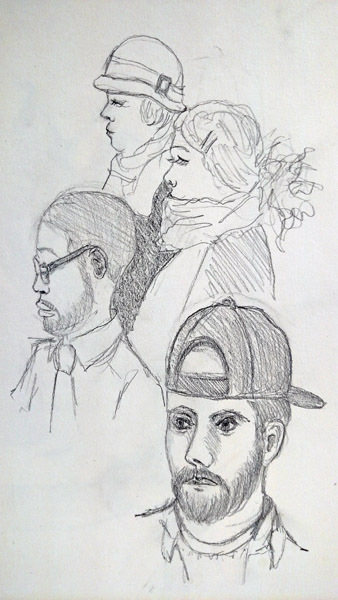 I finished early and was bored again, so I added 3 classmates to what will probably become a crowd! 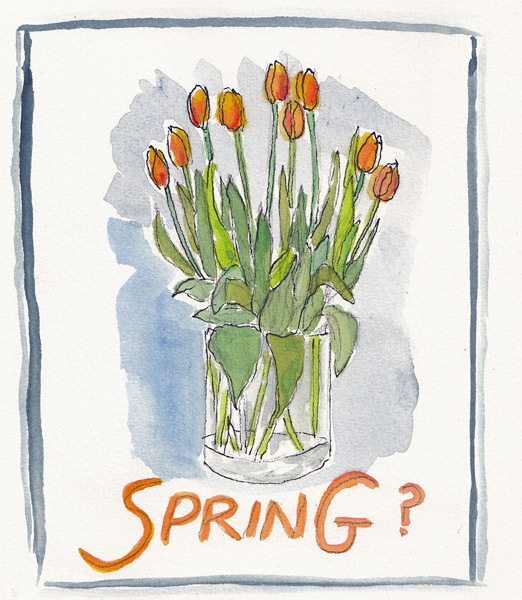 I bought beautiful tulips for our apartment last week in anticipation of the first day of spring. My husband worried that they would be wilted by Saturday/Sunday. 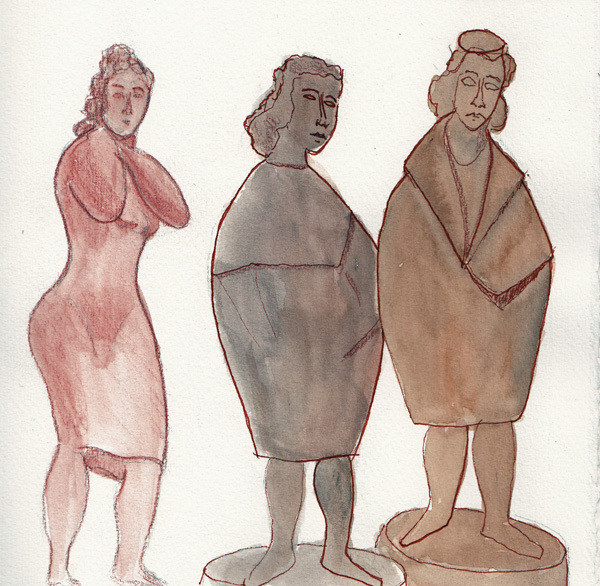 Here they are in a quick painting. 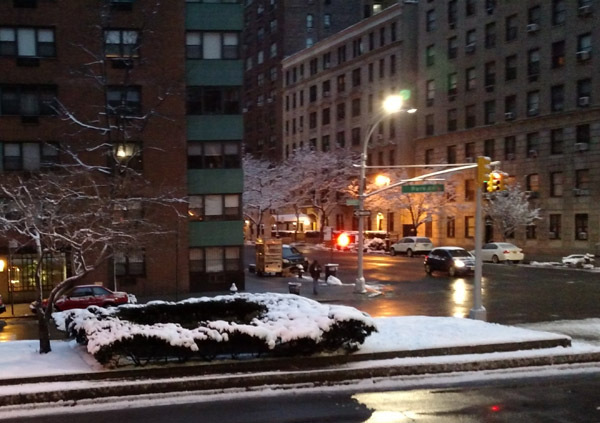 And here is the view from my Window at 6AM on the first day of Spring. We had 4.5 inches of snow in Central Park by the time the snow ended! And we are all still wearing heavy down coats with hoods up!